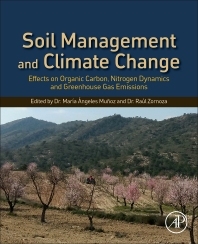 Soil Management and Climate Change: Effects on Organic Carbon, Nitrogen Dynamics, and Greenhouse Gas Emissions provides a state of the art overview of recent findings and future research challenges regarding physical, chemical and biological processes controlling soil carbon, nitrogen dynamic and greenhouse gas emissions from soils. This book is for students and academics in soil science and environmental science, land managers, public administrators and legislators, and will increase understanding of organic matter preservation in soil and mitigation of greenhouse gas emissions. Given the central role soil plays on the global carbon (C) and nitrogen (N) cycles and its impact on greenhouse gas emissions, there is an urgent need to increase our common understanding about sources, mechanisms and processes that regulate organic matter mineralization and stabilization, and to identify those management practices and processes which mitigate greenhouse gas emissions, helping increase organic matter stabilization with suitable supplies of available N.
She has more than 15 years of professional experience in Rural Development and Environmental sector. Currently is carrying out R&D and technology transfer about the design of new technologies in the agricultural and livestock sectors, production systems, waste recycling, bioenergy and soil and landscape reclamation. Additionally, she has significant experience researching conservation and rural development, including climate change, pollution and risk assessments. She has been a specialized researcher in the United States. She has coordinated R&D projects with international and national governments and the private sector. She has directed environmental and rural development programs in the Spanish Ministry for Foreign Affairs and the strategy designs in Spanish-Bolivian cooperation framework program. She has been an international consultant to Corfo-Chilean government in the evaluation of R&D projects. In addition, she has managed agricultural farm productivity, business aspects and subsidies according to European policy instrumental in regional and local economies. His research lines are soil quality assessment, soil reclamation, soil biochemistry and organic matter dynamics. Author of 58 articles, 8 book chapters and 140 presentations in congresses. Participation in 16 competitive research projects. Author of two national patents of invention and one international patent. Awarded with the Outstanding Young Scientist of Soil Science Division Award by EGU. PhD in Environmental Sciences since January 2007. Post-doc researcher at University of Florence (2008) and at the Technical University of Cartagena (2009-2015). Assistant Professor in the Department of Soil Science and Agricultural Chemistry of the University of Cordoba since 2016.